When I told Michael this morning that my next task was to get to work on the meal, he was briefly hopeful that I intended to spend some time in the kitchen. Pauvre Michel! I was merely commenting on my next blog topic. Not that we'll be eating badly tonight. Thanks to the emergence of Picard (http://www.picard.fr/) on the Roussillon landscape, we'll be indulging in Moroccan cuisine: lamb, grain salad with dried apricots, and pastilla packets with tomatoes and olives, houmous & moutabbal on the side. If you search for bouchées d'agneau à la marocaine in the "La Boutique" section, you'll find our main course. My birthday dinner in Barcelona, however, was a meal unlike any we've ever had. As Michael said at the end, "This evening was one magic trick after another." We've watched Heston Blumenthal on television, and I went with our London neighbor Kieron to see him speak at the Royal Institution (where we got to sample tiny tidbits of his wizardry), but we've never forked over the hard cash to eat at The Fat Duck. Via Moo, we got to experience that level of cooking but at more friendly prices. Cost is relative, though--this certainly wasn't a cheap night out. I had found another restaurant that was described as the best value in Barcelona, but we decided in the end to operate on the "What the hell?" principle. Our money is draining away on a daily basis thanks to the economy; we might as well put some to good use before it disappears altogether. Carpe diem! 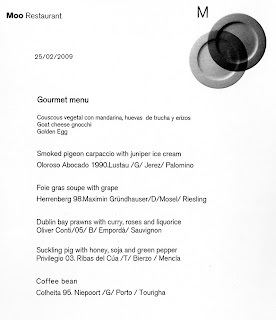 Moo is owned by Joan (chef), Josep (sommelier), and Jordi (pastry genius) Roca. They're probably not as well known outside Spain as the Adrià brothers, Ferrán (El Bulli) and Albert, but along the Mediterranean they're a culinary force to be reckoned with. 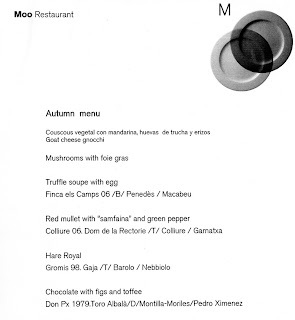 Moo is only their second restaurant; at their first, El Celler de Can Roca in Girona, you have to book months in advance. We got lucky with Moo, reserving a table just the day before. The Rocas oversee the operation, but aren't in residence there. Step into the chic Hotel Omm for a cutting edge dining experience. Trendy interiors replete with large windows, clean lines and hand-painted plates, beckon you time and again. The culinary expertise of the Roca brothers keeps the diners coming in for more. Creative cuisine consisting of contemporary Catalan fare makes up the innovative menu. The ‘half portions' option makes sure you enjoy your meal perfectly and ensures that you don't overstuff yourself. Choose from dishes like sea bass with lemongrass, monkfish with wild mushrooms, or the baby goat roasted in honey and rosemary. Make sure you try their trademark desserts. If selection becomes a tad too difficult, just order the recommended "Joan Roca" set menu, consisting of five dishes and wine. Delicious! The menu changes all the time, so the mouthwatering descriptions on the internet are generally of dishes we didn't sample. Not that we have any complaints. This was probably the best meal we've ever had, even better than those at the Routh Street Café in Dallas and Vong's in London, our previous favorites. Normally the staff prefer that guests order the same multi-course set menu, but our waitress agreed we could choose two different ones in order to sample an even greater variety of food and wine. 1) Michael's pigeon carpaccio with juniper ice cream appeared under a dome. When that was removed, smoke poured out. 2) His humble-sounding "coffee bean" dessert was a delectable fondant encased in a brittle crust of melt-in-your-mouth granules of buttery chocolate cookie. 3) Not on the menu was the final extra. The man at the hotel desk must have told the restaurant it was my birthday, because as Michael was sipping his expresso, a slate slab arrived, bearing a tall taper and an assortment of sweets with a texture we had never encountered before. I think it must have been some type of chocolate and dulce de leche combination. Amazing! Remember that you can click on these menu pages (provided by our helpful waitress when she saw me scribbling notes) if you have trouble reading them at reduced size. 'Moo' sounds fabulous, and less opera bouffe! than Mr Blumenthal's offerings. I was thinking about fantastic food the other day. There isn't much of it about here, but the papyrus we tasted in the Okavango Delta the other day is phenomenal. Texture is somewhere between candyfloss and watermelon, flavour can only be described as light and possibly floral. Most refreshing! Jimmy Ku is the COO of GoPlanit. He clearly keeps close track of internet mentions of his company,since magpiesalmagundi isn't exactly top-of-the-list in random google searches. Richard Fortey makes Michael's day . . . .